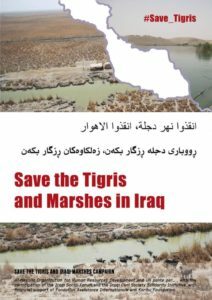 Home / Save the Tigris / Call for Action to Protect the Marshlands of Mesopotamia! We demand transparency from the Iraqi government and UNESCO-Iraq regarding a possible inclusion of the Iraqi Marshes in the World Heritage List. In the last weeks before the 40th session of the UNESCO World Heritage Committee (WHC), scheduled to take place in Istanbul from 10-20 July 2016, Iraq is pressing at multiple political levels for the members of the committee to vote to include the Iraqi Marshlands on the World Heritage List. The Save the Tigris and the Iraqi Marshes Campaign applauds the continued efforts of the Iraqi government and the UNESCO office in Iraq. We sincerely hope the Iraqi Marshes will be included on the World Heritage List. At the same time, we are concerned by the uncertainty and lack of transparency over what will be discussed at the WHC meeting in Istanbul. Today, it is still unclear whether or not Iraq’s nominations for inclusion on the list, including the Marshes, will be on the WHC meeting’s agenda. The intial program of the meeting does not specify which sites will be discussed, and neither UNESCO-Iraq nor the Iraqi government has formally announced what they expect to discuss in Istanbul. Four Iraqi cultural sites are currently listed on the World Heritage List. Three of them – Hatra, Ashur and Samarra – are severely threatened. The fourth, the Citadel of Erbil was added in 2014. Eleven additional sites are on a tentative list for inclusion. The Marshes, which have been on this tentative list since 2003, would be the first Iraqi site to be recognized on the World Heritage List for both cultural and natural significance. Exactly how the Iraqi government will achieve this important recognition for the Marshes is not clear. In January 2014, Iraq submitted to the WHC a nomination dossier titled “The Ahwar of Southern Iraq: Refuge of Biodiversity and the Relict Landscape of the Mesopotamian Cities”, which proposes four natural sites and three cultural sites in the region of the Marshes for recognition. These are: Hawizeh Marsh, Central Marshes, East and West Hammar Marshes (natural), the archeological cities of Ur and Uruk, together with Tell Eridu archeological site (cultural). The WHC has never issued an update on the status of Iraq’s nomination dossier. Furthermore, the committee for Order No. 22 – the Iraqi committee in charge of the Marshes’ file for the WHC – which met on May 5, 2016, has not issued any official information about the status of its efforts to have the Marshes recognized or whether the Marshes will be included on the agenda of the WHC meeting in Istanbul. The Ministry of Environment published a brief news statement about the meeting, with no details concerning the Marshes. Meanwhile, Iraqi President Fuad Ma’asum has called for inclusion of the Marshes on the World Heritage List, and the provincial government of Dhi Qar launched a campaign in April, with the support of the US consul, to include the Iraqi Marshes and other archeological sites on the World Heritage List. The Save the Tigris Campaign calls for discussion of the Iraqi Marshes during the upcoming WHC meeting and emphasizes that the Committee must attach great importance to this site, which has been on the tentative list for more than a decade. The Iraqi government and the office of UNESCO in Iraq should publicly disclose clear information on the status of the Iraqi nomination dossier, so that Iraqis who are concerned about protecting the Marshes and other valuable Iraqi sites have accurate information about what will be discussed at the Istanbul meeting. Since its inception in March 2012, the Save the Tigris Campaign has advocated for the WHC to include the Marshes on the World Heritage List. We have attempted to speed up the nomination process and to advocate for transparency on the status of the Marshes’ file. In 2015, the Save the Tigris Campaign participated in the international NGO conference preceding the WHC annual meeting in Bonn, Germany. Following our recommendations, World Heritage Watch adopted a resolution that included the demands of our Campaign regarding the Iraqi Marshes as well as the endangered town of Hasankeyf in Turkey. We believe this year’s international NGO conference organized by World Heritage Watch prior to the WHC meeting in Istanbul will be highly valuable, providing an important opportunity to advocate for the Iraqi Marshes. Our Campaign members will attend the conference in Istanbul, together with other international activists in order to rally support for urgently needed action on the case of the Marshes. In addition, the Campaign will demonstrate a strong presence before the start of the actual meeting. Recognition of the Iraqi Marshes should be given top priority, since they face grave threats as a result of the continued construction of large dams on the Tigris River and its tributaries in Turkey and Iran. The Ilisu Dam, as well as other associated dams currently under construction in Turkey, the Daryan Dam on the Sirwan River, and similar projects all endanger Iraq’s water resources and could ultimately lead to the disappearance of the Marshes. The Save the Tigris Campaign will be carefully monitoring the planned agenda of the World Heritage Council and will be issuing statements to keep the public informed about progress, or failure, to see that the Marshes are recognized and protected. We call for the protection of the Mesopotamian Marshlands and a halt to construction of all large dams on the Tigris River and its principal tributaries.